Halifax coach Richard Marshall. Picture Tony Johnson. 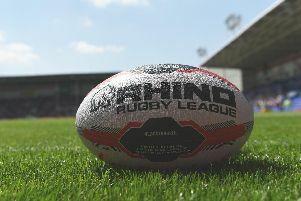 Halifax coach Richard Marshall offered ‘no excuses’ after his side were outgunned by Championship newcomers York at Bootham Crescent to the tune of 38-16. James Ford’s up-and-coming outfit blasted into an 18-0 lead inside the opening 12 minutes, repeatedly exposing their visitors around the ruck. Fax got close to getting on terms at 18-10 at the break, with a Dan Fleming try and an outstanding finish from winger Shaun Robinson, but they sank without trace after the restart, finishing on the wrong end of an 8-1 penalty count in the second 40 minutes. 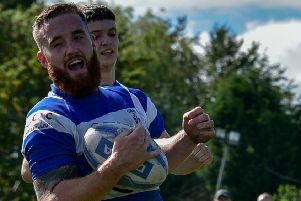 “We’re disappointed, I’m disappointed,” said Marshall, who was clearly frustrated by his side’s inconsistency after the encouraging manner of last week’s win over Dewsbury. “We didn’t get anything and we didn’t deserve anything. Collectively we were way off. “We need to take a long, hard look at ourselves and what we’re trying to do here. “You get asked the question ‘What went wrong?’ but if we knew that it wouldn’t have gone wrong in the first place. “I thought our attitude was spot on against Dewsbury last week, but when things got tough today I think it went the other way, which isn’t something we say very often. “They’re a strong team who are very good at home, they don’t concede many points and they put some good scores on teams here. “They certainly did that today. “They got us in and around the ruck and put 18 points on us in a very short space of time. “They played very quick and they thrived off our mistakes. “We’ve conceded a hatful of points again and that’s not acceptable for this team. “That’s been a strong part of our game but it’s not at the moment. “We need to keep looking at that and working out the reasons why. “We did well to get back in with a fighting chance at 18-10, but we don’t want to be one of those teams that is always fighting back from a deficit. “We put ourselves under pressure and our discipline unravelled in that second half. Fax were forced into changes before kick off, with Ben White replacing Ben Johnston at half back after the latter injured his leg against the Rams. Player-coach Simon Grix was still not considered fit to play, with Marshall calling up Castleford prop Will Maher, who spent much of last season at the Shay, on dual registration. “Johnno wasn’t quite right and Grix wasn’t ready to play,” he said. “We know all about Will; he’s a really good player who was with us all last year.